Are Xtracycles taking over in your part of the country? According to BikePortland, Xtracycles are taking over. Have you experienced the phenomenon in your part of the country? I love the shot of the gaggle of Xtracycles all lined up. Awesome. Can’t wait to see a similar shot in Seattle. Seattle definitely has more Xtracycles cruising the mean streets than a year ago. If the seven Xtracycles in the photo do in fact all belong to women, there’s something to be said for women being the key to a successful bike culture. What an excellent shot and powerful statement about the success of Portland’s bike culture. This entry was posted in bigger than here, bikes, longbikes, sustainability, xtracycle and tagged bike culture, bikes, women, xtracycle. Bookmark the permalink. I haven’t seen the Xtracycle in Austin, yet. It looks fantastic! Great photo! We love our Xtracycles! We’ve had them since spring, and we use them all the time. They’re so practical for all kinds of excursions. I think you’re right about women being the key to a successful bike culture. I do most of the errands in our family – to the library, market, bank, post office, etc. – so I make several trips a week. These types of trips are ordinary, yet very visible in the community, so people take notice. I think that helps people think about the possibilities with bikes. Are Xtracycles available in Germany? I have never seen one around here. I’m with lavanna. I live in Pflugerville, Tx. and ride to Austin and Round Rock often and have yet to see an Xtracycle in person. Xtracycles are becoming the minivan of bike culture. We are seeing more and more X’s and BD’s here in MPLS! I’d love to think that they are taking over in Boulder, but so far I have only seen(in person) 4, and 2 of them belong to my family! I have given out a lot of X cards, though maybe things will catch on! I also agree that women are the key to changing bike culture….OK I happen to believe that we are key to instituting MOST cultural change. I do know that if I had not insisted on getting 2 for our family, my husband couldn’t have been bothered! Hey Mary, I’m another habitant of the Boulder area, and have seen at least 4 other xtracycles in town, and know of a couple others not including you guys or myself. From the folks I know the proportions of new to old seem reflective of Xtracycle’s sales boom this season. I’d love to see something like that picture in the post in person. We’re definitely not anywhere near that. I will let you know when I see one in Austin! I’ve still only seen two X’s in the north/central side of Tacoma, including mine. Aside from errands and group rides, I’ve taken it on two organized rides this year (May Day Metric and Courage Classic); mostly because it’s the most fun bike I own, but also to show and tell people that such a bike exists. Anne: You’re IN several similar shots, such as this one: https://carfreedays.com/2008/09/02/labor-day-ride-update/ I think they’re doing it a bit more often in Portland, but we’ve been at it longer! Hopefully, this really will sweep the nation. Sounds like longtails are taking off all over the country. The CO contingent is certainly growing. The last time my sister was in Durango, she spotted many Xtracycles. axel – you can mailorder an Xtracycle directly from the company. Although I’m sure something similar is available in Germany. Or you could head over to Holland – we saw many longbikes when we were there last year. Can’t wait to hear about some cargo bikes in Texas – lavanna and MarkR, maybe you should take the lead! 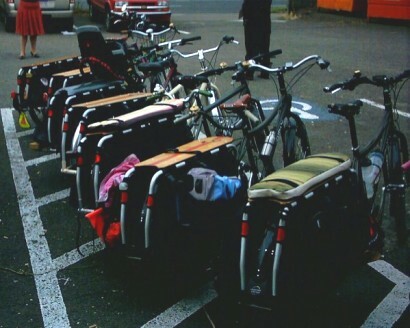 Val is right – we’ve had that many Xtracycles at our cargo rides. Maybe next time we should line up all the bikes and pose them for a photo! oh and doc, I love the minivan analogy – I’d much rather ride an Xtracycle than drive a minivan! Here you go: http://tinyurl.com/3zl6xp and http://tinyurl.com/3kqwk4 The one time we actually got a bit organized. I’m in Portland for now, on Oct 4th we make the move to Austin/Round Rock for a little. Then there will be at least one x in austin. I love mine. Just got done with a trip to the Oregon coast on with it. Dad came up for the trip with his yak bob trailer. He hated it. Had to keep taking gear from him and put it on the xtra. It is so fun. The looks, questions and general “ahhh, that makes sense”. I love it. I can’t wait to bring my green bikey self to Austin. I would really like to figure out how to get Austin where Portland is in terms of being a bikey town. Platinum status for Austin? I’d like to see that. Thanks for your answer, Anne. I just found out that I live only 50 km away from the European distributor! Funny that, eh? Here in Charleston, WV, I am one of two Xtracyclists. I just got a Big Dummy (woot!) after tooling around on a Fuji Montero+X which was about to fall apart. Axel: Try http://www.used.de, that’s where I got mine from. That’s my X on the far right and yes, those bikes ARE all women-owned. As for Tampa, mine is the only one I’ve seen in the wild. Most of the local bike shops keep begging me to ride it over one day so they can lay eyes on one in “real life”.